I came across this article on the RETRO ZAP website about the “STAR WARS” Prequel movies called “Beyond Good & Evil in the Prequels”, written by Michael O’Connor. And while I had no problems with most of the article, I had a problem when he centered his focus on Mace Windu. “Mace Windu, in particular, is a scowling character who seems fond of putting fools in their place, whether it’s a fellow Jedi like Qui-Gon Jinn or Anakin Skywalker or an adversary like Count Dooku or Chancellor Palpatine. Mace seemed “fond of putting fools in their place” . . . including Anakin Skywalker and Qui-Gon Jinn? What exactly was Mr. O’Connor trying to say? That Master Windu, one of the senior members of the Jedi Council, had no right to put others in their place when they stepped out of line? Why? Was it because the character was not featured in the Original Trlogy? 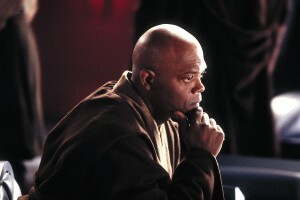 Or was it because Master Windu was portrayed by an African-American actor? Had Mr. O’Connor really forgotten that other Jedi characters like Qui-Gon, Yoda, Obi-Wan Kenobi and Ki Adi Mundi had done the same? And why did Mr. O’Connor point out Mace’s attempt to kill Palpatine in “STAR WARS: EPISODE III – REVENGE OF THE SITH”, yet failed to point out Yoda’s murder attempt on the same character? In the same movie? Was Mr. O’Connor trying to say that as a character portrayed by a black actor, Mace did not have the right to step out of line in such a manner? Only Yoda was allowed? He pointed out that Yoda had not only accepted the Clone Army on behalf of the Republic, he also led them into battle on Geonosis in “ATTACK OF THE CLONES”. He also pointed out Yoda’s lies to Luke Skywalker or withholding of the truth about Anakin/Vader’s true identity. But he failed to point out Yoda’s attempt to murder Palpatine. Why? Mr. O’Connor also pointed out Obi-Wan Kenobi’s condescending attitude toward beings he considered as lesser being – like Jar-Jar Binks and nine year-old Anakin Skywalker. Yet, he failed to point out Obi-Wan’s capitulation to rage after Darth Maul had struck down his Jedi master, Qui-Gon Jinn in “STAR WARS: EPISODE I – THE PHANTOM MENACE”. Mr. O’Connor failed to point out Obi-Wan’s attempt to convince the older Anakin to spy on Chancellor Palpatine (whom the Jedi believed had a Sith Lord within his circle), even when the younger man felt uncomfortable about the suggestion. And he failed to point out that Obi-Wan had left a disabled Anakin to slowly burn to death on a lava bank, following their duel on Mustafar. Many claim that Obi-Wan could not bring himself to quickly kill his former apprentice . . . as if his lack of action was something merciful. As far as I am concerned, it was not. Leaving someone to slowly die in agony does not strike me as merciful. I admire Mr. O’Connor’s attempt to point out that the “STAR WARS” saga was not one painted in a black-and-white morality. Well, most of it. And I admire his willingness to appreciate the moral ambiguity in George Lucas’ tale – especially in the Prequel Trilogy. What I did not appreciate was his willingness to use Mace Windu as the main scapegoat for the mistakes of the Jedi Order. Or paint the character as the worst offender within that organization. If he was so willing to point out the worst that Master Windu had done, he could have done the same for not only the other Jedi characters, but other characters within the Prequel Trilogy as well.